This rig selection is designed for anglers needing rigs which can be cast maximum distances. Each rig is clipped down to extend casting distance, and also protects baits as the make impact with the water – ensuring top bait presentation. Two clipped down rigs with size 1/0 Kamasan B940 Aberdeen hooks are included for all round fishing for species such as flounder, plaice, codling, whiting and so on. Two clipped down pennell rigs are also included with size 2/0 and 3/0 Cronus Silver Aberdeen hooks for anglers targeting larger species such as cod, bass and rays. 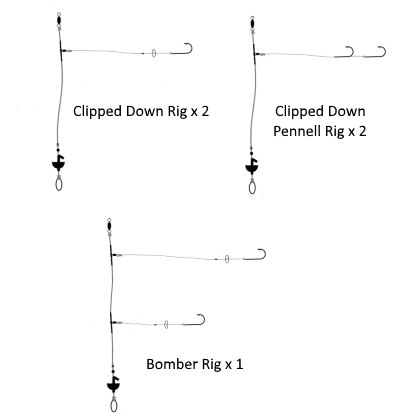 Finally, a bomber rig with size 1/0 Cronus black Aberdeen hooks is also included. This rig allows anglers to clip two different baits down behind the same impact shield, allowing two baits to used.